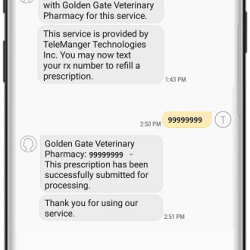 Clients can now request refills by text message! Pet owners asked and we answered! Requesting refills is easier than ever with our new Text-to-Refill system. Clients register with a quick text and they are set up to request refills as needed. No leaving voice messages, no waiting to speak to a representative. Just a simple text and the refill process is rolling. You will receive a confirmation message. Request a prescription refill by texting your prescription number (upper left corner of the RX label) to (862) 235-9781. To submit multiple refill requests, separate each number with a comma. You will receive a text confirmation of your submission.